The Department of Biology collaborates closely with institutions in St. Louis as well as national and international organizations. The E. Desmond Lee and Family Professor of of Zoological Studies (Dr. Patricia Parker) links the Department to the Saint Louis Zoo, and the E. Desmond Lee and Family Professor in Plant Sciences (Dr. Xuemin Wang) links the Department to the Donald Danforth Plant Science Center. The Whitney R. Harris World Ecology Center, a unit within the Department of Biology, was formed in 1990 through a collaborative agreement between UM-St. Louis and the Missouri Botanical Garden. The Center also has a formal partnership with the Saint Louis Zoo through a memorandum of understanding signed by UM-St. Louis and the Zoo in 1995. The Center has formal partnerships with the Faculté des Sciences, University of Antananarivo, Madagascar; Universidade Federal de Uberlandia, Brazil, Institute of Ecology, A.C., Xalapa, Veracruz, México, and with CEIBA Biological Center, Inc., Guyana. The Department of Biology collaborates through a cooperative consortium with the Departments of Biology at Washington University, Saint Louis University and the Southern Illinois University-Edwardsville. The University is a member of the St. Louis University Research Consortium that operates Lay and Reis Field Stations in Missouri. All of these collaborations are designed to accelerate our research efforts and maximize opportunities for our students. 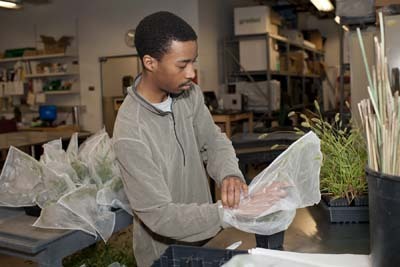 For one of many examples, check out this release on Kevin Cox, a Biology undergraduate student working at the Danforth Plant Science Center.